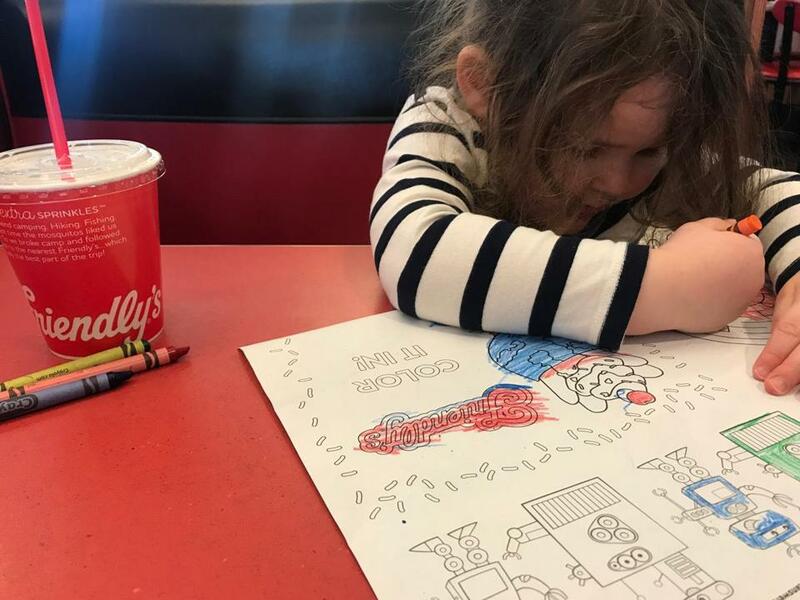 On her first visit to Friendly’s, the reporter’s 3-year-old daughter got a lot of coloring done. I took my 3-year-old to Friendly’s last week. It was the little grilled-cheese-and-ice-cream enthusiast’s first trip, and probably my last: I had come to say goodbye. The fall of Friendly’s has been the corporate equivalent of a melting Cone Head sundae since the Massachusetts-based chain filed for bankruptcy protection in 2011. And lately, the restaurants have been disappearing like fries from a plate. About two dozen more, mostly in upstate New York, are slated to close, the company announced last week. That brings the total number of stores remaining to 174. There are hundreds of former Friendly’s littering the landscape now, and the one I loved is among them. It closed years ago, one of 60 or so restaurants shuttered during the initial bankruptcy proceedings. It’s the one that my grandmother took me to, more times than I can remember, along the Boston Post Road in Guilford, Conn. I’d order a chicken sandwich — a fried cutlet, a kaiser roll, a green lettuce leaf, and a quick slather of mayo — then a peanut butter cup sundae. She’d get a patty melt and a Fribble. Was it good? I have no idea. But it was perfect. For some synaptic reason I can’t quite understand, the taste of that roll and that chicken and that mayonnaise lingers in my mouth 30 years later. The sight of the Friendly’s logo — that red cursive on white siding — conjures my grandmother’s memory as surely as a picture of her smile or the smell of the now-tattered quilt she sewed for me. That’s a lot to load onto a failing restaurant chain that I’ve barely patronized in decades. It’s an impossible standard, and impossible standards guarantee disappointment. And so I was, I confess, a little nervous to return. But I decided to pay one final visit, before it’s too late. Although the three closest Friendly’s locations to my home in Quincy have all closed, there’s still one kicking in Weymouth. The concept of other people’s grandmas is still a little abstract to my daughter, but on the ride over, I explained that my grandmother used to take me to a restaurant just like this. “Are we going past grandma’s house?” she asked. My girl loves her grandmas, and I can relate. I wasn’t so much a mama’s boy as a grandma’s boy, eager to spend limitless amounts of time doing grandmother things — gardening, playing Scrabble — well beyond the age at which this might have still seemed normal or cute. Janet Hole Wells served in the Army during World War II and was active in the League of Women Voters. She quilted and volunteered and cared for her grandkids. And she loved newspapers so much that when her eyes failed she had a big machine installed in her house, passing every column inch under a magnifier and peering at an oversized screen a few inches from her face. She did not live long enough to see me write for this one. She did not live long enough to meet her great-granddaughter. I wish she had. She admired the freezer stocked with ice cream when we walked in, and as the server brought us to a booth she tried to sit at every one along the way. She examined the kids’ menu — “Why do we have to leave it for other children?” — and ordered milk, grilled cheese, and apple slices. Our drinks came as she was scribbling away on the placemat. “I got a lot of work to do, and then I can drink my milk,” she said. The simple chicken sandwich I used to order was nowhere to be found on the menu, and instead I ended up with some sort of honey barbecue chicken melt. I was hungry, so I ate it. Of all the chicken sandwiches I’ve had, it was most certainly one. This isn’t a restaurant review, so let’s leave it at that. But the peanut butter cup sundae was almost exactly as I remember. We looked at a picture of my grandmother I’d brought, and then, at my daughter’s request, pictures of her grandmother: my mom. I fielded an unending stream of questions (“Why do your feet reach the floor? Why don’t my feet reach the floor? How long will it be? Is that the kitchen? Why is that the kitchen?”). By noon, nearly every booth was filled — parents and their kids, seniors and their adult children, teens on dates, moms and dads corralling their toddlers. “I wish this was a real reckaurant, so I could play here,” mine said, her conception of “restaurant” as garbled as her pronunciation. We who fancy ourselves sophisticated diners often think of places like Friendly’s as different from real restaurants, and I understand why. But if restaurants are really about more than just feeding people — if they are about family and experience and memory — then Friendly’s, for as long as it lasts, will be as real for me as any chic brasserie or bistro. It isn’t quite time to write Friendly’s obituary yet, but it does feel like a farewell. May your Fribbles melt slowly, and forever.